In Islamic history, no woman has ever been a judge before. 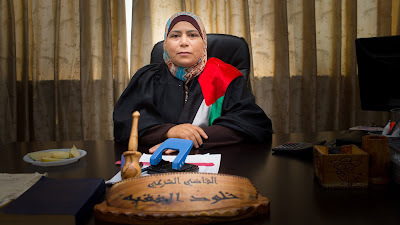 Kholoud Al-Faqih started as a lawyer, but wanted to be a judge in the Shari'a court, which is the family court. Kholoud parents have a 6th and 8th grade education, but they have 12 kids and they paid for them all to go to university. They wanted them to have a good education, and believe that woman should have just as much education as men, so that they don't have to rely on anyone else. Kholoud broke gender roles. Most people in the culture didn't believe she should be a judge. They believe woman and men have certain roles. Many believe woman are just there to have kids and pleasure men, and woman aren't educated and don't know their rights. Kholoud feels we live in the 21st century, not the 10th, and she won't live like we are in the 10th century. I loved this documentary. It showed several cases that Kholoud had to deal with, as well as the sexism in Islamic culture. One of the crazier things I learned was how many men get away with murdering the wives. They call it an honor killing, and often when a woman is killed, people will say "what did she do to get herself killed?" Khouloud shows that woman can do anything men can do. It's a very empowering film, and a must see documentary. THE JUDGE screens for the last time November 13th at 10:30 AM. For more information and tickets go here.